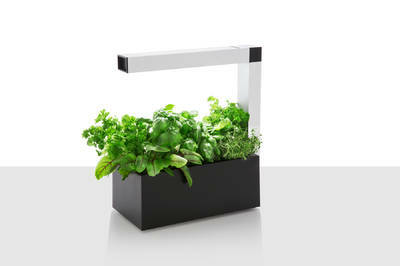 The HERBIE indoor garden combines beautiful design and convenient functionality in one solid product. The highly developed Active Growing Technology guarantees quick growth and plentiful harvest. Urban gardening made easy, Herbie is designed to let you grow a wide variety of plants year-round, from flowers to herbs to veggies. The Active Growing Technology ensures that the different types of plants prosper without extra effort from you. What is better for a salad or cooking than just-picked herbs and greens? 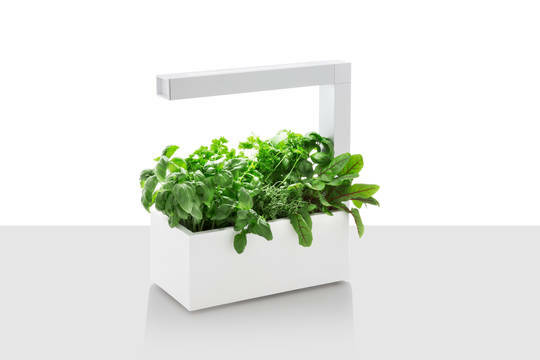 With the HERBIE indoor gardening system, anyone can be be a successful gardener. 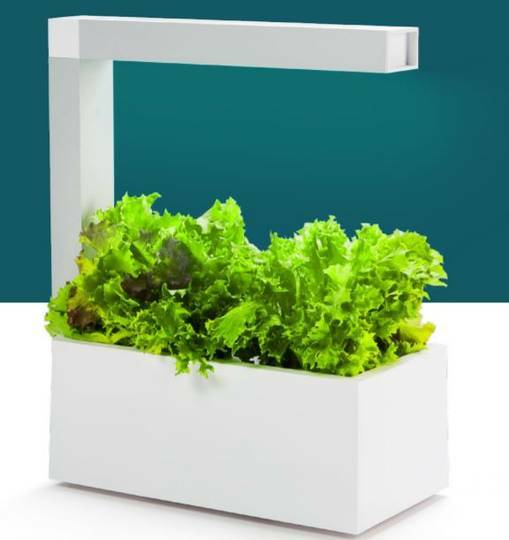 That's because the HERBIE system uses an integrated hydroponics system and special lamp to grow plants up to 3 times faster than ordinary pots. 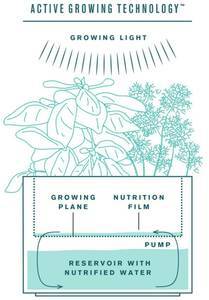 Simply fill the reservoir with water and nutrients, put in your plants or seed pods, and turn it on. All you need to do is check the water level every 3-5 days, and change the water every three weeks. 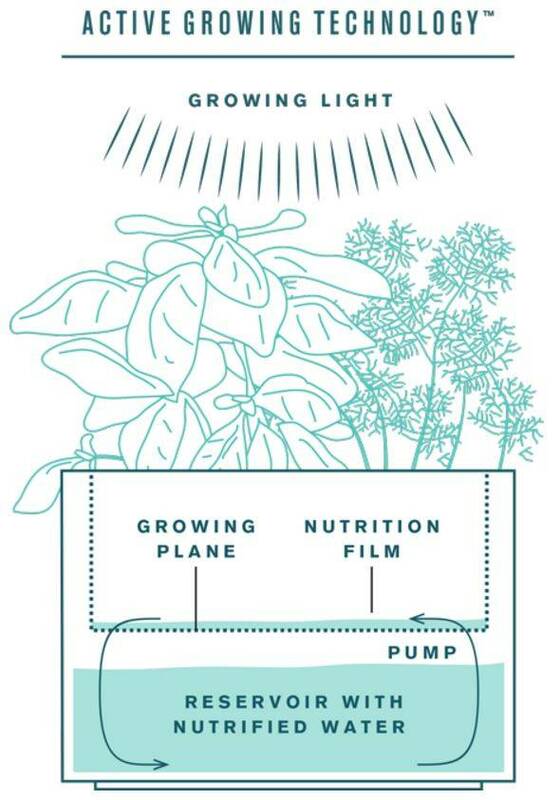 The pump automatically distributes the optimum amount of nutrients. 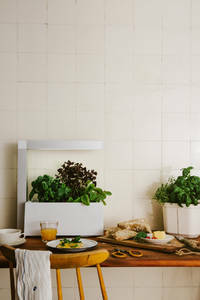 It is also useful for growing and maintaining store-bought potted herbs at home. These usually die within a few days after purchase, but in our experience they grow and thrive in the HERBIE system. The HERBIE indoor garden was designed by in Stockholm by Mikael Ericsson. The aluminum and polymer construction is elegantly understated, and fits in any decor. 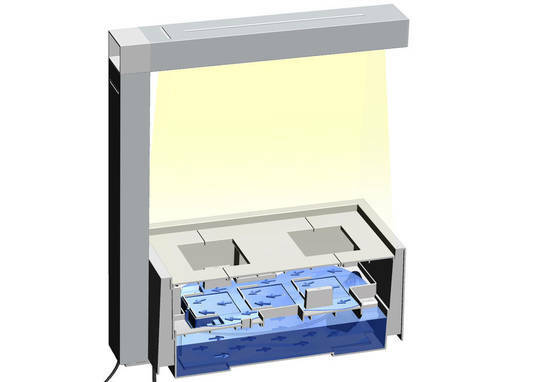 Because it is completely self-contained and has integrated lights, it is suitable for any room. 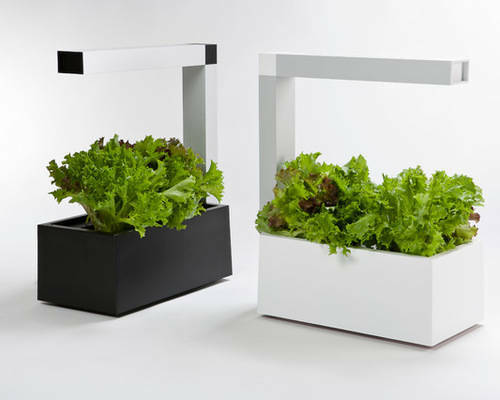 And because of the hydroponic technology, you can fit more plants in a smaller space. 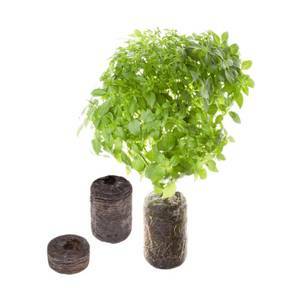 The HERBIE system can fit up to six 11 cm pots at once. The Active Growing Technology™ is a state of the art hydroponic cultivation system where plants are grown in a soilless aquatic-based environment, where nutrients are distributed via water. 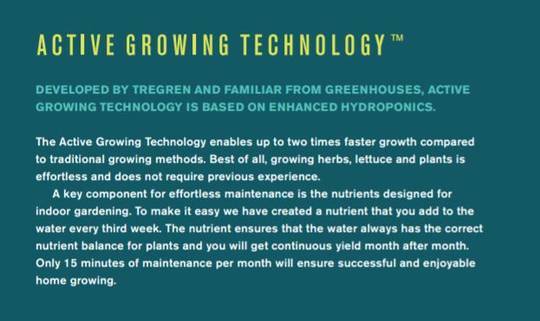 To put it simply, with Active GrowingTechnology™ all of us can enjoy fresh herbs, lettuce and vegetables in our homes all year round. Grow plants and herbs in the middle of winter or start plants in early spring when it is still cold outside. Download the user manual for detailed information. With the HERBIE system you can use your own plants or seeds, or use the specially designed Seed Pods for added convenience. Seed pods are compressed ecological peat pellets, containing just the right amount of seeds. The peat pellet has a diameter of 5 cm, and when placed in water they expand to a height of 6 cm.Seed Pods are available in a wide variety of herbs, vegetables, and fruits. 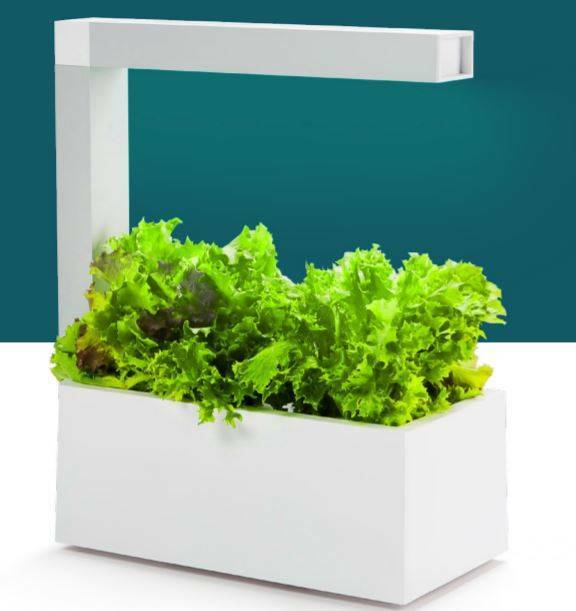 This extended lamp arm gives plenty of space for taller growing herbs and vegetables. Tomatoes and peppers will love the 68 centimeter height, giving them plenty of room to grow. These seed pods are designed to be the ideal substrate in all Tregren indoor gardens. These are blank seed pods, allowing you to use your own seeds. Simply soak the seedpods in water until they expand, then add your seeds. The hydroponics fertilizer is developed by Kekkilä and it is packed in dosage bags so that the plants will always have the correct amount of nutrients. The fertilizer includes calcium, nitrogen, phosporus, minerals and additives and is designed for fruits and flowers. The growth nutrient is sold in packages of 8. Tregren’s Seed Pods are an easy and effective way to grow herbs and salads ecologically. Seed pods are compressed ecological peat pellets, containing just the right amount of seeds. The peat pellet has a diameter of 5 cm, and when placed in water they expand to a height of 6 cm. Unused seed pods remain usable for many years, and are ready to grow fresh herbs and salads as soon as it is placed in water. This kit contains one jalapeno pepper seed pod. Tregren’s Seed Pods are an easy and effective way to grow herbs and salads ecologically. Seed pods are compressed ecological peat pellets, containing just the right amount of seeds. The peat pellet has a diameter of 5 cm, and when placed in water they expand to a height of 6 cm. Unused seed pods remain usable for many years, and are ready to grow fresh herbs and salads as soon as it is placed in water. This kit contains one strawberry seed pod. Tregren’s Seed Pods are an easy and effective way to grow herbs and salads ecologically. Seed pods are compressed ecological peat pellets, containing just the right amount of seeds. The peat pellet has a diameter of 5 cm, and when placed in water they expand to a height of 6 cm. Unused seed pods remain usable for many years, and are ready to grow fresh herbs and salads as soon as it is placed in water. This kit contains one tomato seed pod. Tregren’s Seed Pods are an easy and effective way to grow herbs and salads ecologically. Seed pods are compressed ecological peat pellets, containing just the right amount of seeds. The peat pellet has a diameter of 5 cm, and when placed in water they expand to a height of 6 cm. Unused seed pods remain usable for many years, and are ready to grow fresh herbs and salads as soon as it is placed in water. This kit contains one habanero pepper seed pod. Tregren’s Seed Pods are an easy and effective way to grow herbs and salads ecologically. Seed pods are compressed ecological peat pellets, containing just the right amount of seeds. The peat pellet has a diameter of 5 cm, and when placed in water they expand to a height of 6 cm. Unused seed pods remain usable for many years, and are ready to grow fresh herbs and salads as soon as it is placed in water. The starter kit contains one each of oregano, parsley, basil, and thyme seed pods. Tregren’s Seed Pods are an easy and effective way to grow herbs and salads ecologically. Seed pods are compressed ecological peat pellets, containing just the right amount of seeds. The peat pellet has a diameter of 5 cm, and when placed in water they expand to a height of 6 cm. Unused seed pods remain usable for many years, and are ready to grow fresh herbs and salads as soon as it is placed in water. This kit contains two rocket seed pods. Tregren’s Seed Pods are an easy and effective way to grow herbs and salads ecologically. Seed pods are compressed ecological peat pellets, containing just the right amount of seeds. The peat pellet has a diameter of 5 cm, and when placed in water they expand to a height of 6 cm. Unused seed pods remain usable for many years, and are ready to grow fresh herbs and salads as soon as it is placed in water. This kit contains two coriander seed pods. Tregren’s Seed Pods are an easy and effective way to grow herbs and salads ecologically. Seed pods are compressed ecological peat pellets, containing just the right amount of seeds. The peat pellet has a diameter of 5 cm, and when placed in water they expand to a height of 6 cm. Unused seed pods remain usable for many years, and are ready to grow fresh herbs and salads as soon as it is placed in water. This kit contains two bloody sorrel seed pods. Tregren’s Seed Pods are an easy and effective way to grow herbs and salads ecologically. Seed pods are compressed ecological peat pellets, containing just the right amount of seeds. The peat pellet has a diameter of 5 cm, and when placed in water they expand to a height of 6 cm. Unused seed pods remain usable for many years, and are ready to grow fresh herbs and salads as soon as it is placed in water. This pack contains two thyme seed pods. Tregren’s Seed Pods are an easy and effective way to grow herbs and salads ecologically. Seed pods are compressed ecological peat pellets, containing just the right amount of seeds. The peat pellet has a diameter of 5 cm, and when placed in water they expand to a height of 6 cm. Unused seed pods remain usable for many years, and are ready to grow fresh herbs and salads as soon as it is placed in water. This pack contains two tarragon seed pods. Tregren’s Seed Pods are an easy and effective way to grow herbs and salads ecologically. Seed pods are compressed ecological peat pellets, containing just the right amount of seeds. The peat pellet has a diameter of 5 cm, and when placed in water they expand to a height of 6 cm. Unused seed pods remain usable for many years, and are ready to grow fresh herbs and salads as soon as it is placed in water. This pack contains two sage seed pods. Tregren’s Seed Pods are an easy and effective way to grow herbs and salads ecologically. Seed pods are compressed ecological peat pellets, containing just the right amount of seeds. The peat pellet has a diameter of 5 cm, and when placed in water they expand to a height of 6 cm. Unused seed pods remain usable for many years, and are ready to grow fresh herbs and salads as soon as it is placed in water. This pack contains two parsley seed pods. Tregren’s Seed Pods are an easy and effective way to grow herbs and salads ecologically. Seed pods are compressed ecological peat pellets, containing just the right amount of seeds. The peat pellet has a diameter of 5 cm, and when placed in water they expand to a height of 6 cm. Unused seed pods remain usable for many years, and are ready to grow fresh herbs and salads as soon as it is placed in water. This pack contains two oregano seed pods. Tregren’s Seed Pods are an easy and effective way to grow herbs and salads ecologically. Seed pods are compressed ecological peat pellets, containing just the right amount of seeds. The peat pellet has a diameter of 5 cm, and when placed in water they expand to a height of 6 cm. Unused seed pods remain usable for many years, and are ready to grow fresh herbs and salads as soon as it is placed in water. This pack contains two mint seed pods. Tregren’s Seed Pods are an easy and effective way to grow herbs and salads ecologically. Seed pods are compressed ecological peat pellets, containing just the right amount of seeds. The peat pellet has a diameter of 5 cm, and when placed in water they expand to a height of 6 cm. Unused seed pods remain usable for many years, and are ready to grow fresh herbs and salads as soon as it is placed in water. This pack contains two lollo rosso seed pods. Tregren’s Seed Pods are an easy and effective way to grow herbs and salads ecologically. Seed pods are compressed ecological peat pellets, containing just the right amount of seeds. The peat pellet has a diameter of 5 cm, and when placed in water they expand to a height of 6 cm. Unused seed pods remain usable for many years, and are ready to grow fresh herbs and salads as soon as it is placed in water. This pack contains two lemon basil seed pods. 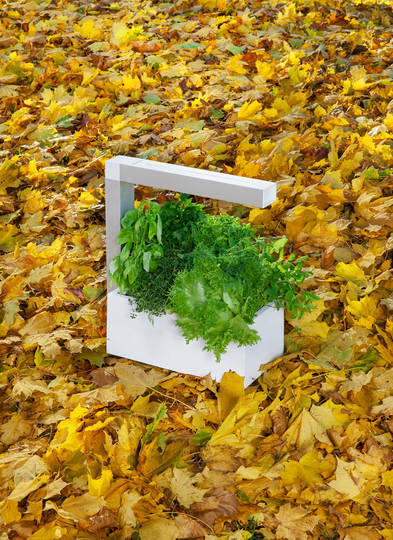 Tregren’s Seed Pods are an easy and effective way to grow herbs and salads ecologically. Seed pods are compressed ecological peat pellets, containing just the right amount of seeds. The peat pellet has a diameter of 5 cm, and when placed in water they expand to a height of 6 cm. Unused seed pods remain usable for many years, and are ready to grow fresh herbs and salads as soon as it is placed in water. This pack contains two lettuce seed pods. Tregren’s Seed Pods are an easy and effective way to grow herbs and salads ecologically. Seed pods are compressed ecological peat pellets, containing just the right amount of seeds. The peat pellet has a diameter of 5 cm, and when placed in water they expand to a height of 6 cm. Unused seed pods remain usable for many years, and are ready to grow fresh herbs and salads as soon as it is placed in water. This pack contains two dill seed pods. Tregren’s Seed Pods are an easy and effective way to grow herbs and salads ecologically. Seed pods are compressed ecological peat pellets, containing just the right amount of seeds. The peat pellet has a diameter of 5 cm, and when placed in water they expand to a height of 6 cm. Unused seed pods remain usable for many years, and are ready to grow fresh herbs and salads as soon as it is placed in water. This pack contains two basil seed pods. Replacement water pump for HERBIE system. Set of upper and lower lids. Total 5 pieces per set.